Infection occurring in relation to the central nervous system. Length of treatment — Antibiotics should be continued for at least 5 days after symptoms resolve. Not less than 14 days according to some author. Brain abscess, Empyema, Cord abscess. 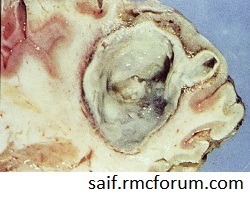 Contiguous spread – CSOM, Sinusitis, Odontogenic infection. Hematogenous spread – Pulmonary, Cardiac, Dental infection, GI infection, Systemic infection. In adult- Lung abscess(most common), Bronchiectasis and Empyema. In children- Cong. Cyanotic heart disease esp. TOF. Following penetrating trauma or Neurosurgical procedures. Mostly MCA territory and on the Lt. side. Pulmonary origin- usually multiple, Cardiac origin- usually solitary. In patients with septic embolization, risk of cerebral abscess is elevated in areas of previous infarction or ischemia. CSOM and mastoid air cells- Temporal lobe and cerebellar abscess. Nasal Sinusitis- Frontal lobe abscess. Sphenoid sinusitis- Least common but high incidence of intracranial complication due to venous extension to cavernous sinus. Strptococcus– most frequent, 33-50% anaerobic and microaerophilic. Toxoplasma, Nocardia – common in immunocompromised patients. 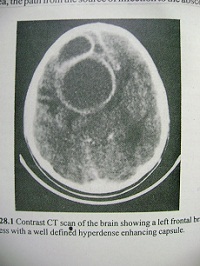 CT scan- Depends upon the stage of the disease. Usually Iso to hypodense lesion, with contrast ring enhancement. MRI – Iso to hypointense in TIWI, hyperintense on T2WI, ring enhancement in gadolinium enhancement.